Marriage of Miss Nell Cochrane to Mr. Frank Woods. St. Paul Church Crowded With Friends of the Young Couple—An Elaborate Wedding. Last evening St. Paul's church was beautifully decorated for the marriage of Miss Nell Cochrane to Mr. Frank Woods . The chancel was one greenery of palms and pines and the rail and twisted brass stands of the chandeliers were hung with boughs of autumn leaves. Half an hour before the appointed time the eight hundred people began gathering, and Mrs. Rice began playing a sort of musical prelude, which deepened the feelings of expectation and suppressed excitement which pervaded the church. At half past six there was a little pause, and then came the first stirring notes of that perfect wedding march of Lohengrin . Twenty girls of the Delta Gamma fraternity entered, marching down the left aisle, carrying ropes of smilax and bunches of loose roses, singing the words of the wedding march. Dr. Lasby took his place under the palms before the chancel. The twenty girls came slowly forward and ranged themselves on either side of him. Next came Miss Daisy Cochrane , the maid of honor, dressed in white silk and carrying a bouquet of pink roses. Last came the bride herself, in white ottoman silk, her veil drawn back from her face, carrying bride roses. She came slowly down the aisle, with perfect repose, seeming scarcely to move, but rather to be borne onward by the triumphant tenderness of Wagner that surged from the organ. She is a beautiful woman, would be considered beautiful anywhere, and never in her life has she been so lovely as last night. The groom, attended by Mr. Hugh Lamaster , entered from the vestry and met the bride before the chancel. The wedding march died slowly into the marriage service, "To have and to hold * * * in sickness and in health * * * for better or for worse * * * for richer or for poorer * * * till death us do part." The bride was given away by her father , and after the service of the ring and the prayers marched out the right aisle on the groom's arm to Mendelssohn's wedding march. The bride's dress was of white ottoman silk, heavily trimmed with lace, made princess with a long square train. Her veil was white tulle. The ushers were Messrs. Reese , Beecher , Low and Gregory , members of the Beta fraternity . After the ceremony the wedding party was driven to the bride's home. After refreshments were served they drove to the depot, where amid showers of rice the bride and groom took the night train for St. Louis and the south. They intend to go down the river to New Orleans and will be gone some weeks. After December 1 they will be home at 2003 F street, where their new home awaits them, ready furnished, save for the numerous and costly wedding presents, which are stil at the home of the bride's father. The wedding was in every respect elaborate and St. Paul's church was crowded with friends who rejoiced in the happiness of two young people whom Lincoln delights to honor. Miss Nelle Cochrane: Nelle (sometimes spelled Nellie) M. Cochrane (1871-19) was born in Illinois, the elder of grain dealer Thomas Cochrane's two daughters. The Cochrane family moved to Lincoln, Nebraska by 1886, settling at 1141 D Street. Nelle was a member of the University of Nebraska's class of 1893; she was a charter member of the Delian Society in 1889, as was her future husband, Frank Woods. She was part of a circle of Cather's friends that included Louise Pound, Minnie DePue, and Thomas Wing. The Nelle Cochrane Woods Art Building at the University of Nebraska in named for her. Frank H. Woods: Frank H. Woods (1868-1952) was born in Illinois, the second of the four sons of Frederick Moffatt Woods (1844-1928). The family was living at 26th and J Streets in Lincoln by 1886. Frank graduated from the University of Nebraska in 1890, where he played "right end rusher" in the second football team in 1889; he was a charter member of the Delian Society in 1889 before becoming a member of the Beta Theta Pi fraternity in 1890. After briefly attending Columbia University's law school in 1890-91, he returned to the University of Nebraska where he earned his law degree in 1892. Frank Woods and two of his brothers formed the Woods Brothers' real estate company in 1889, a company which developed many residential areas in Lincoln and is still an important real estate firm. In 1903 Woods and three other men formed an independent telephone company (later known as Lincoln Telephone and Telegraph) in 1903; as president, Woods was an innovative and progressive leader, pioneering the use of dial telephones. Stella J. Rice: Stella J. Rice (c. 1866-after 1909) was born in Iowa, the younger daughter of Edgar G. and Frances A. Rice, who ran a fancy-goods and millinery store. Like her sister, Carrie Belle Rice Raymond, Stella became an accomplished musician, especially on the piano and organ. She moved to Lincoln to join her sister in the mid-1880s and soon became active in the musical life of the city. In 1889 she joined the faculty of O. B. Howells' new Nebraska Conservatory of Music as the organ teacher. Lohengrin: In Richard Wagner's opera Lohengrin (1850), Elsa von Brabant is falsely accused of killing her brother, the rightful Duke of Brabant; she calls upon a knight whom she has seen in her dreams to be her champion: a knight (Lohengrin) appears in a boat drawn by a swan. After proving her innocence the two are married to the sounds what became one of the most famous of bridal processionals. However, the wicked Ortrud tempts Elsa to break her promise not to ask about her husband's name or origins, and Lohengrin is forced to return to his father, Parsifal. In The Song of the Lark (1915), Dr. Archie sees his former protégée, Thea Kronborg, singing Elsa von Brabant at the Metropolitan Opera. Twenty girls of the Delta Gamma fraternity: The twenty Delta Gamma bridesmaids may have included Josephine Tremain ('92), Martha (Mattie) Hutchison ('93); Jesse M. Law, Lulu M. Green ('94), and Pearle Camp (ex-'94); Helen Gregory, Grace Bridge ('95), and Bertha Law (ex-'95); Helen Harwood ('96), and Joy Webster and Frank Woods' sister, Fannie E. Woods (ex-'96). Stella Rice was a member in urbe. Delta Gamma fraternity: The Delta Gamma sorority (fraternity was a term used for both men's and women's organizations) was organized at the University of Mississippi in 1872. Kappa chapter, at the University of Nebraska, was organized in 1887.
smilax: About 200 species of smilax, sometimes called briar or greenbriar, are native to the eastern United States. The thorny vines generally have oval, shiny green leaves, evergreen in some species, and red or black berries in late summer and fall. Wagner's wedding march: The wedding march in Wagner's Lohengrin (1850) is played by the orchestra at the opening of Act III. It is followed by the bridal chorus, sung by Elsa's ladies, which the Victor Book of the Opera (1912) translates as:	Faithful and true, we lead thee forth	Where Love, triumphant, shall crown ye with joy! Star of renown, flow'r of earth, Blest be ye both far from all life's annoy! Champion victorious, go thou before! Maid bright and glorious, go thou before! Mirth's noisy revel ye've forsaken,	Tender delights for you now awaken;	Fragrant abode enshrine ye in bliss;	Splendor and state in joy ye dismiss! Miss Daisy Cochrane: Daisy Cochrane (born about 1876) was the younger daughter and fourth child of Thomas and Hannah M. Cochrane. ottoman silk: Ottoman silk, named for its supposed origins in the Ottoman (Turkish) Empire, is a textile which is woven with a filler yarn to create a ribbed effect. It is a rich, heavy fabric, now used often for academic robes. Mr. Hugh Lamaster: Hugh Lamaster (1869-1938) was born in Nebraska; his father, Joseph E. Lamaster (1830-1902), and mother, Catherine Rice Lamaster (b.1836) were early settlers in Johnson County, in southeast Nebraska. Hugh Lamaster came to Lincoln to study at the university c. 1886, and graduated with the class of 1890. He attended Columbia Law School and the University of Nebraska Law School, and was a member of Beta Theta Pi fraternity. He married Inez Holmes c. 1903 and was an attorney in Tecumseh, Johnson County, c. 1908; he moved to Lincoln before his death. her father: Thomas Cochrane (1846-after 1909) was born in Ireland. He came to the United States as a youth, where he married his wife, Hannah (born c. 1848 in New Jersey). They moved to Fulton County, Illinois, where he was a brick and tile manufacturer, according to the 1880 census. 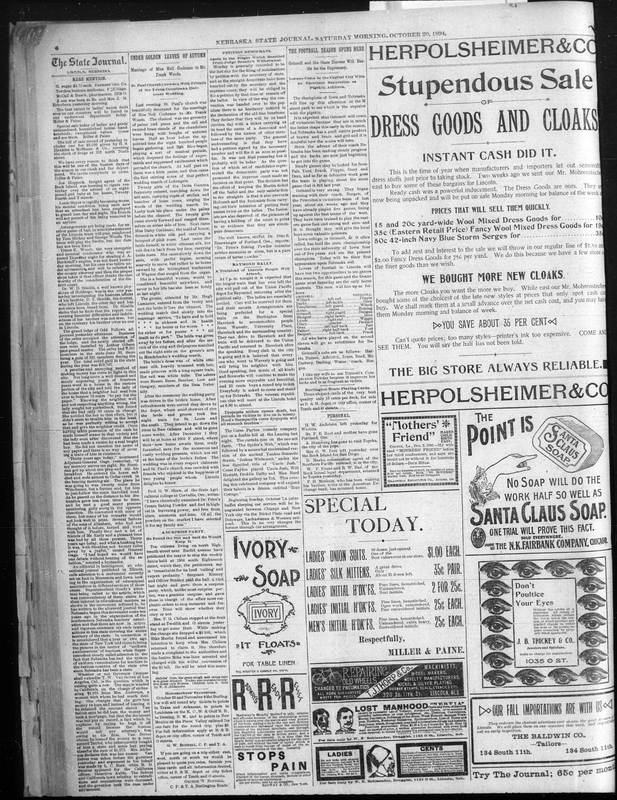 The family, with four children—Manning, Nelle, William, and Daisy—moved to Lincoln c. 1884; the 1886 and later Lincoln city directories show that Cochrane was a grain dealer, living at 1141 D Street. Mendelssohn's wedding march: This wedding music, often used as a recessional, is said to have been used for a wedding first at the marriage of Queen Victoria's eldest daughter, the Princess Victoria, to the crown prince of Prussia, later Wilhelm I, in 1858. It was composed as part of the incidental music Mendelssohn wrote for A Midsummer Night's Dream (op. 61) in 1843.
made princess: A dress in which the bodice and skirt are cut in one, with shaping done by lengthwise seams. The style is said to have been popularized by Alexandra, Princess of Wales, c. 1870. It has always been a style of elegant simplicity, and was unusual in the 1890s, when two-piece dresses (with separate bodices and skirts) were usual. Harry Allen Reese: Harry Allen Reese (1869-1939), son of lawyer and later supreme court judge Manoah B. Reese, took his LL.M degree at Nebraska in 1895; he is listed as a member of Beta Theta Pi fraternity in urbe in the 1894 Sombrero yearbook. He practiced law in Lincoln in the early twentieth century before retiring to California by the mid 1930s. Jesse Bradford Beecher: Jesse Bradford Beecher, '94, was a member of Beta Theta Pi fraternity. He took his MA at Nebraska in 1896. Low: The 1894 Sombrero yearbook does not list anyone named Lowe as a member of Beta Theta Pi; the 1936 Alumni Directory does not list any graduate of the University of Nebraska named Lowe for the years 1885-97, although an Edmund Lowe attended the university as a member of the class of 1887. Charles Buckingham Gregory: Charles Buckingham Gregory, '91, was born in Massachusetts c. 1870, the son of a Congregational minister; the family, which included his sister Helen Gregory, '95, was living in Lincoln by the time of the 1880 census. By 1909 he was cashier of the American Savings Bank in Lincoln, of which his father, Lewis Gregory, was president. He later moved to Chicago. Beta fraternity: The Beta Theta Pi fraternity was organized at Miami University (Ohio) in 1839; the Alpha Tau chapter at the University of Nebraska was established in 1888.
the bride's home: The Cochrane family lived at 1141 D Street in Lincoln, a two-story house on a nearly quarter-block lot. St. Louis: The city of St. Louis, Missouri, is at the confluence of the Missouri River and the Mississippi River. The French had established a mission on the site in 1703, but the first permanent settlement was by Pierre Laclede in 1764. The United States acquired St. Louis with the Louisiana Purchase in 1803. The city grew rapidly, becoming one of the largest and most influential cities in the Midwest (it was the fourth largest city in the country in 1900), as a commercial and cultural center and a transportation hub. New Orleans: The city of New Orleans, Louisiana, was founded by the French in 1718 near the mouth of the Mississippi River. It became the major port for commerce with the interior of the continent, and a major cultural center in the South. 2003 F street: The 1891 Sanborn Fire Insurance maps show no house here, so it must have been recently built. The 1903 Sanborn map shows a wide house facing the end of a block, with many bay windows and a wrap-around porch. Lincoln delights to honor: In chapter six of the Bible's book of Esther, the king, wishing to honor Mordecai, asks Haman, "What shall be done unto the man whom the king delights to honor?" Haman, thinking the king wants to honor him, suggests royal apparel and a parade throughout the city. Thus Haman leads Mordecai's horse proclaiming, "Thus shall it be done unto the man whom the king delighteth to honor."